Six Year Celebration and Giveaway! By the way, everything is 30% off at Dreamspinner until the end of today! I’d planned a big celebration, in part because I totally forgot to celebrate the fifth anniversary last year. I confess, I don’t feel much like celebrating right now. I’ve been stunned and horrified by the results of this past election. For about 48 hours, I seriously considered giving up writing because it seemed like a frivolous use of my time in the increasingly hostile and dangerous environment in this country. With the encouragement of friends, and the sound advice of mentors, I decided now, more than ever, we need our storytellers. But I still didn’t feel much like celebrating. Yet the sentiments I expressed in that post are meaningless if we don’t take pleasure, peace, and comfort where we can find them. Switching off the news to watch kittens play doesn’t mean you aren’t outraged at what’s happening in this country, or terrified for what it means for you and your loved ones. It means you can’t hold sustained fear in your heart, and you need a break from it. If you follow me on Twitter (where I am far more political than anywhere else) you’ll note that my tweets have been flip-flopping between frothing-mad post-election commentary and, well, puppies and kittens. I promise you, I’m not schizophrenic, nor is a saner someone wresting my Twitter account away from me at times. It’s that now that the shock, grief, and terror have stopped boiling over and are simmering in the background, I have to take stock of my life and plan for what the future will bring. Where to put my time and money. How to not just manage my fear, but harness it. And part of that means celebrating the little things, and continuing to be grateful for what I have. 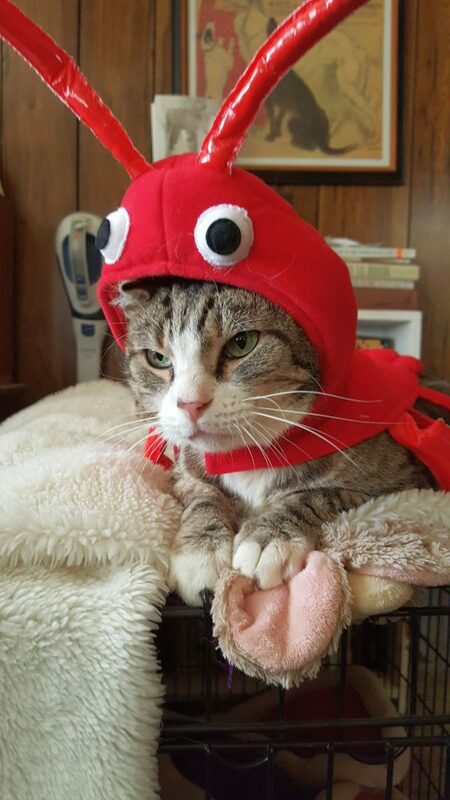 Such as a cat who tolerantly allows me to dress it in a lobster costume for Halloween. Hence, a smaller-than-planned celebration, but a party just the same. For the next seven days, I’m holding a contest here on the website. If you want to play, then post something that makes you happy: a photo of your pets, a link to a funny meme, your favorite, upbeat song or vid on YouTube. Include your contact email, and I’ll put you in the running for your choice of one e-book from my backlist. Enjoy! This entry was posted in Uncategorized and tagged announcements, contests, Dreamspinner Press, gay romance, giveaway, GLBTQ, male male romance, sale, Sarah Madison, writing by Sarah Madison. Bookmark the permalink. Hah! You’d probably enjoy Crying for the Moon, then. You’re entered (so far you’re the only entry, so the odds are in your favor! ), so good luck! Sarah Madison recently posted..Six Year Celebration and Giveaway! Oh, that made me LOL! Seriously! Which hasn’t been easy to do this week, thank you! You might enjoy my Olympic story, Fool’s Gold–which has saddles, but no Michael Phelps. 🙂 You’re in the running for the contest–yay! I’m glad that I could make you laugh. There’s definitely a need for that right now. Lord, yes, we all need to laugh. Well, if you win, you can pick something else then! This made me grin–thank you!